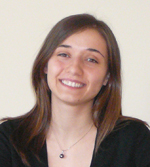 After spending her freshman year at Cal Tech, Raluca transferred to MIT, maintaining a perfect GPA at both institutions. In the summer between, Raluca worked on a research project at the University of Illinois that resulted in a paper at SOSP. It is rare indeed for anyone to be on track to be an author on papers based on research in each undergraduate year. She also has served as an undergraduate tutor for the Office of Minority Education at MIT, and currently participates in the Women's Outreach Program for the ECE Honor Society.